An addictive indie horror film from the 20th century has a chance to rise from the distribution grave as long as the negative survives. Or even a release print that has gone all red. The film might have vanished from theaters, never played USA’s Up All Night or been written up in Film Comment, but as long as someone connected to an indie DVD company embraces and wants to share the film once more, there’s a chance at a new life and an appreciative audience. 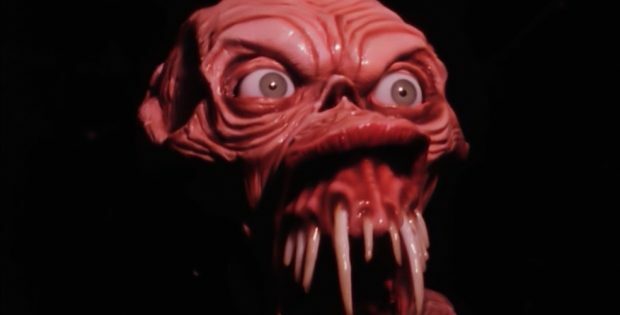 Such is the case with The Suckling, a horror film that couldn’t quite escape the New York area when it was originally released in 1990. Now the bizarre scares of The Suckling are running across America. Mary (Ella Aralovich) sleeps as a doctor sneaks into her bedroom and injects her with a serum. She gets taken to a hospital where the nurses are covered in blood and uniforms that extremely revealing. Turns out that she’s dreaming, but is stuck in the psyche unit of a hospital. One of the doctors observing her tells describes how Mary is the only survivor of a horrific attack. The action flashbacks to Mary and her boyfriend Billy (Tim Martin Crouse) walking towards a creepy old house. Turns out Mary is pregnant and Billy wants her to visit a combination brothel and outlaw abortion clinic to just talk with “the doctor.” Turns out the medical profession is Madame Big Mama (Janet Sovey), who doesn’t seem to care much for hygiene. Mary takes drink and talks about why she wants to keep the baby. Except it turns out the drink knocks her out and Big Mama gets down to surgery. She has her “assistant” flush the fetus down the toilet. Things get messy when it gets stuck in the system and gets covered in some sort of toxic goo that makes it a monster. Things inside the brothel get weird when a girl shoots down a client and a strange organic substance covers the windows and doors. It even rips away the phone lines. Making things extra worse is that the creature climbs through the plumbing and attacks people inside with sneak attacks from the toilet. How did Mary survive? The Suckling is a gritty New York horror movie with a touch of the absurd. It shares a bit of the rough joys found in Frank Henenlotter’s Basket Case although on an even lower budget. The good news is that they money did seem to go to the creature effects. The monster gets bigger and more frightening over time with fangs and dripping goo. It even sprouts giant tendrils so that it can grab people from a distance. There’s such a “let’s make a movie” feel to the action. There’s no slickness on the screen outside of the fake blood dripping off the victims. The sound effects are a touch off. The walls shake. But whatever they lacked in Hollywood professionalism is more than made up in moments that you can’t wait to share with a pal in retelling the story of how only one person survived. The ending and even the scene in the credit sequence is worth staying in your seat. The Suckling makes an amazing edition to your collection of grainy New York area fright fests. DVD with all the features of the Blu-ray minus the resolution. Teenage Mutant Ninja Fetus (13:04) interviews actor Michael Gingold. He was at NYU film school whose classmate needed an actor to fit inside the costume on weekdays. He was in Troma’s War and Toxic Avenger II. He recounts the shoot. He currently writes for Fangoria. Video Interview with director Francis Teri (12:02) talks about all the work that went into making his film. He didn’t chose the horror topic to make the film political. The budget of the film was $50,000 and the creature effects cost $10,000. Archival Image Gallery (2:31) has behind the scenes shots, publicity photos, script pages, magazine articles and the original poster. Vinegar Syndrome presents The Suckling. Directed by Francis Teri. Screenplay by: Francis Teri. Starring: Frank Rivera, Marie Michaels, Gerald Preger. Rated: Not Rated. Running Time: 89 minutes. Released: March 26, 2019.